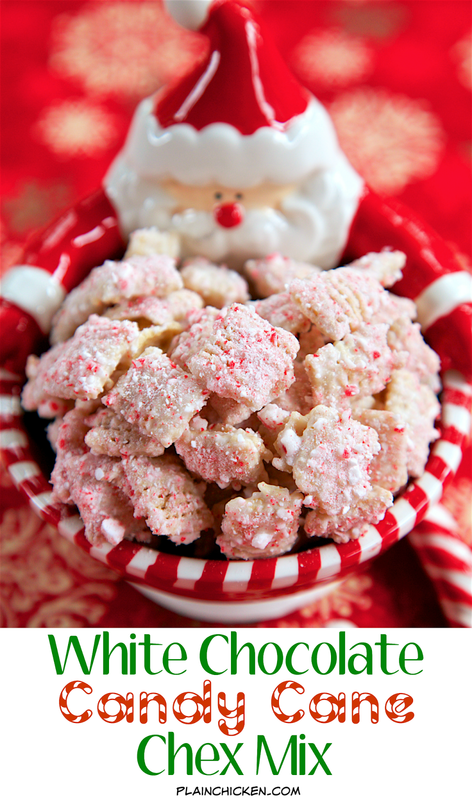 White Chocolate Candy Cane Chex Mix Recipe - only 3 ingredients!! 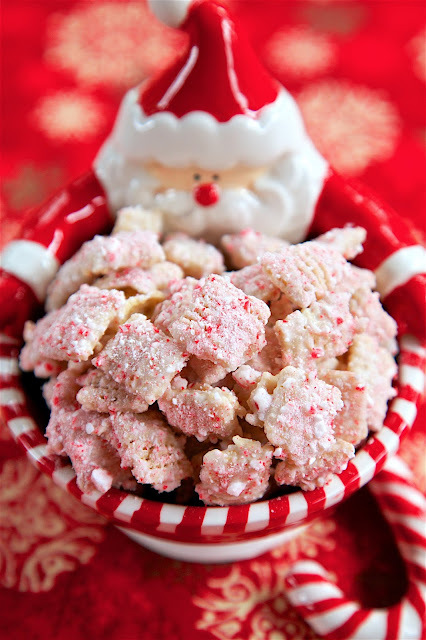 White Chocolate Candy Cane Chex Mix - only 3 ingredients!! This stuff is addictive! I couldn't walk past it without having a bite. Makes a great quick gift for friends, neighbors, teachers and co-workers. Quick and easy gift that everyone will enjoy! 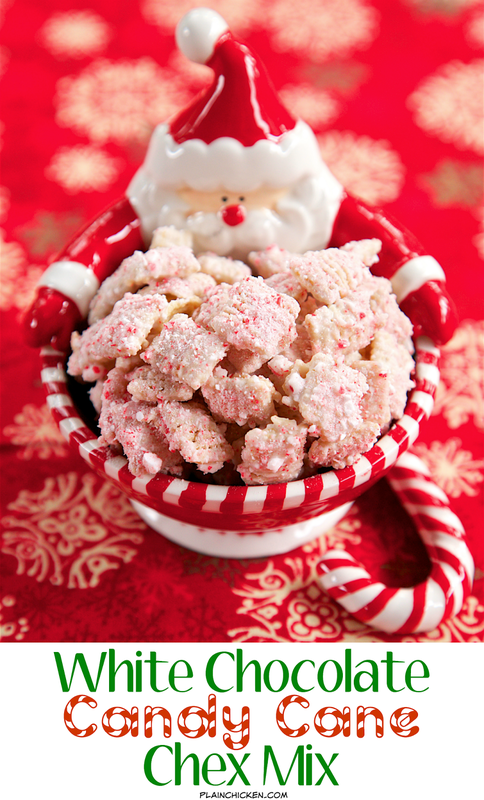 I should rename this White Chocolate Candy Cane Chex Mix to "Christmas Crack". It is SO addictive! I couldn't walk past it without having a bite. Thankfully, I had some great friends that agreed to take most of this mix off my hands. This recipe only has 3 simple ingredients and takes about a minute to make. It makes a ton, so it makes a great gift. It is perfect for friends, neighbors, teachers and co-workers. Put some in a cellophane bag and tie it up with a red ribbon. Quick and easy gift that everyone will enjoy! Melt candy coating according to instructions on the package. Add the peppermint oil to the candy coating and pour over cereal. Stir until all the cereal is coated. Pour cereal on wax or parchment paper and allow to harden. Once the cereal has hardened, break into pieces and enjoy! Looks like I've found what I'm going to be making today! This looks good, but I want your dish! That is so cute! Thanks for sharing. 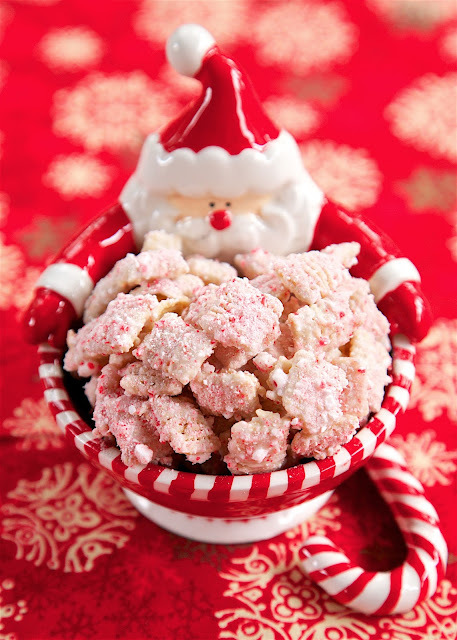 the food processor pulverizes the candy canes nicely, but i prefer to double bag them and whack them with a meat mallet. It works and makes me feel better. Us the regular, hook shaped candy canes, right? Not the soft stick ones? Can't wait to make this! Yes- that is what I used. Enjoy! I'm addicted to this as well. I use white chocolate chips instead of almond candy coating though. YUM! I wonder if I could use the soft peppermints to get the same outcome? Your recipe looks great but any kind of mint makes me ill. Is there something else you could suggest? Thanks.